These deficiencies went unaddressed for a long time and Xhaka himself appeared unable to alter his game in order to iron the mistakes out. His lack of pace and mobility, coupled with his regular losses of defensive concentration and habit for making rash tackles, led to him becoming a defensive liability for the Gunners. What has not helped the 26-year-old, though, is that for the vast majority of his time in north London the style of play at Arsenal has done nothing to protect his weaknesses. Rather, in being left exposed in an unbalanced midfield contingent, Xhaka’s frailties were amplified. Under Arsene Wenger, Xhaka was all too often burdened with a huge amount of defensive responsibility without being also given the right players around him to support him in his task. Now, however, following the arrivals of manager Unai Emery and 22-year-old Uruguayan Lucas Torreira, the 70-cap Switzerland international is finally in the right environment to thrive at Arsenal. Together, in a tough test against unbeaten Liverpool on Saturday, Xhaka and Torreira were able to dominate the midfield area and remain defensively solid throughout. 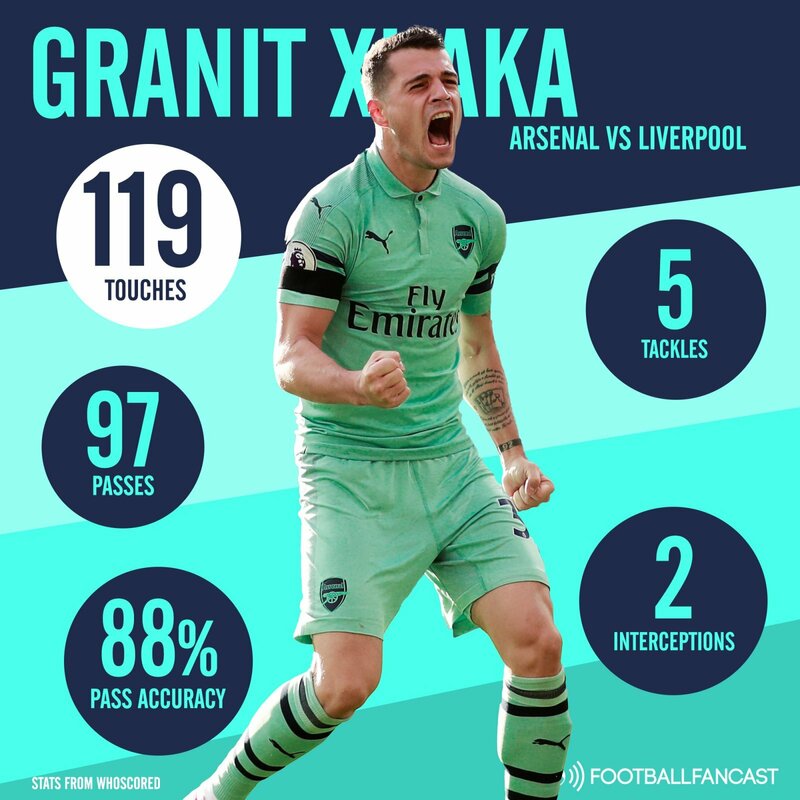 With his workload lightened due to the presence of Torreira, Xhaka was able to produce five tackles (more than any other Arsenal player), two interceptions and make two clearances. On top of his defensive shift, Xhaka was confident and composed as usual in possession. He racked up 119 touches and 97 passes against the Reds – in both cases he led all players on the pitch by a considerable margin. Not only that, he also produced a remarkably high pass accuracy rating of 87.6%. Xhaka has always been excellent on the ball, but now he is also operating in a system that suits him and he looks all the more relaxed for it. Torreira’s presence is now allowing the best to come from Xhaka too, making the Gunners’ engine room as solid, effective, hard-working and cohesive as it has been in many years.